My Latino influenced products hunt is still on. 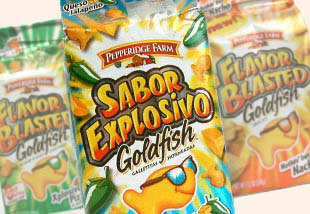 This is one of my recent findings: "Pepperidge Farm's" Sabor Explosivo, Queso Jalapeño baked snacks. Category: Line Extension. Part of Pepperidge Farm's line of flavored Goldfish flavored crackers. Design: No comments about color, type or imagery because follows the design style of the category. Back Panel: Is completely in English. Dual/Bilingual design. Copy: Nutrition Facts are en Español and English. Insight: Mentions the word "Authentic" in Spanish, "Cocidas al horno con queso auténtico" that stresses the fact that the Hispanic consumer needs to have the real thing. We'll send you an email when new topics are posted (about once week). Add our RSS/XML feed to your favorite newsreader and you’ll instantly be in touch with new posts. R.Bird & Company, Inc. is a New York identity and design consulting firm with more than 20 years of experience creating package design, brand identity, corporate identity, corporate communications, website, application, and user interface design solutions. Its clients are internationally-recognized brands and strategy-oriented organizations. Portfolio - Browse through a selection of our design work. ©Copyright 2002- R.Bird & Company, Inc. Some rights reserved. Unless otherwise noted, ¿Ask Marivi? is released under the following creative commons license.